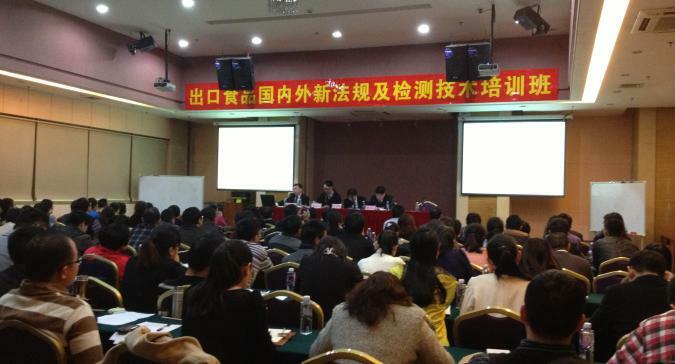 On February 18, 2014, PMA China representative, Mabel Zhuang, presented the PLU code system to an audience of Chinese customs officials and food exporters in Shenzhen. Entitled New Regulations and Rules for Exported Foods, the two-day training was organized by the China Import Quarantine Association (CIQA), the government association affiliated with China’s General Administration of Quality Supervision, Inspection and Quarantine (AQSIQ). The event was attended by over 130 participants, approximately half of which were CIQ officials and half Chinese food exporters, including many fresh fruit and vegetable exporters. The training covered a wide range of topics including the U.S. Food Safety Modernization Act (FSMA), new Hong Kong chemical residue regulations, and China’s organic certification requirements, among others. Most speakers were Chinese government officials from various CIQs, the Certification and Accreditation Administration (CNCA), and the Hong Kong Food and Environmental Hygiene Department Center for Food Safety. Q: If a company prefixes a “9” to a PLU code for a product that is not actually organic, what is PMA’s role in responding to this? A: The PLU code system is a voluntary industry standard for improving supply chain and retail efficiency. There are several organic standards by which products may be certified, and it is the responsibility of retailers and traders to verify the legitimacy of organic certifications for the products they provide. Q: What if a product is GMO, however the “8” prefix is not included on its PLU code? A: Firstly, there are relatively few GMO fresh produce items when compared with major staple foods such as grains and beans. Secondly, the PLU code system is designed for efficient product identification among the trade, not for informing consumers about product characteristics. As such, PMA does not hold liability for how the codes are used, and it remains the responsibility traders and retailers to verify product authenticity. Although fresh fruits or vegetables are currently rarely seen with PLU codes in China, its application is expected to increase in coming years. The presentation was well-received by attendees and served to increase knowledge of the PLU code system among key members of the government and trade. For fruit and vegetable exporters, applying PLU codes to their products can improve efficiency in trade with countries where the system is widely used. For government officials, the training will help in answering questions from both traders and consumers as the PLU system becomes increasingly recognized and applied in China.